Hezbollah leader connects between Gulf state blacklist and normalizing ties with Israel, says most Arabs still view Israel as an enemy. Hezbollah leader Hassan Nasrallah on Sunday claimed there is a connection between the recent blacklist of his organization as a terrorist group by Gulf states with the desire of royal Saudi family and other Gulf regimes to normalize relations with Israel. Speaking at a memorial for a Hezbollah commander killed in Syria and quoted by Haaretz, Nasrallah declared that normalizing ties with Israel will fail because most of the Arab people still regard Israel as an enemy and an “occupier”. According to Nasrallah, the blacklist of Hezbollah was an expression of anger and disappointment on the part of the Saudis and their allies after their failures in Syria and Yemen. "He who fails gets angry and the one who gets angry makes decisions that vent his rage and frustration and looks for scapegoats, and this time Hezbollah and Lebanon became the scapegoats," he said, according to Haaretz. Nasrallah distinguished between what he saw as a difference in approach between the regimes that choose to see Israel as a friendly nation and the people, including civil organizations an political parties. In his view popular reactions in the Arab world and those of some of the governments that support Hezbollah are a message to Israel that most of the Arab world will not accept Israel as a friendly state, or a state that the Arab world can embrace. "The reactions in the Arab world mostly support rejection and this is different than the position presented by some Arab regimes, mainly in the Gulf," Nasrallah was quoted as having said. Even if some Arab regimes want normalization with Israel, the people oppose it because Israel is an occupier, and a country that harms the rights of the Palestinian people and all Arab nations, he added. The Hezbollah leader pointed at the incident in the Egyptian parliament last week when a legislator threw a shoe at his colleague for his meeting with the Israeli ambassador and the decision to oust that lawmaker. Nasrallah said his organization was preparing a plan to confront the decision made against it, according to Haaretz. 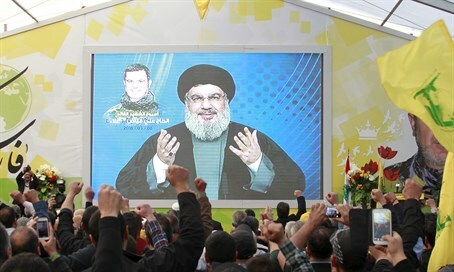 The fiery speech comes after the Gulf Cooperation Council (GCC) last week designated the Shiite Hezbollah for its "terrorist acts and incitement in Syria, Yemen and in Iraq". The move was the latest step taken by Gulf states, led by Sunni powerhouse Saudi Arabia, against Hezbollah, which is backed by Iran, Saudi Arabia's main regional rival. Last month, Saudi Arabia halted a $3 billion program for military supplies to Lebanon to protest what it said was "the stranglehold of Hezbollah on the state". The GCC move can be seen as a step up in the tensions between the Sunni states and their Shiite rival Iran, in tensions that have particularly grown since the Iran nuclear deal last year that reportedly has already begun to launch a regional nuclear arms race. The GCC move is not the first time that Hezbollah has been designated a terrorist group. In 2013, Bahrain became the first Arab country to blacklist Hezbollah, citing evidence that the group was attempting to incite terrorism from abroad.